While wandering around the backlot of the blog – ‘pay no attention to the man behind the curtain,’ I finally found the time setting, under ‘settings!’ Every time I posted it looked like I was burning the midnight oil and staying up until the wee hours to write my entry – not me! The clock was set at UTC time, which is what, Universal Time? Anyway, I fixed it! 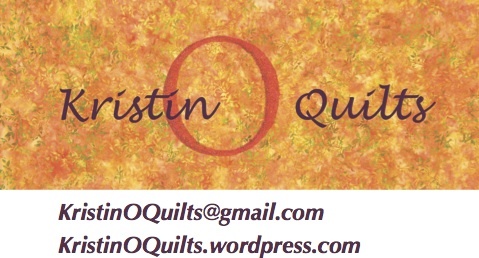 This entry was posted in Uncategorized on September 17, 2012 by kristinoquilts. Why is it that I need the deadline to finish? I’ve had months and weeks to prepare, but I need to see that finish line looming ahead for me to really put it in gear! Yesterday I edited the last two patterns that I wanted to complete before the show. Crazy problems between my old word processing program – Word, and my current one – Pages; BUT there is more than one way to solve every problem. Today I completed my business card. Again, forging through the unknown, which is a huge galaxy for me. I will now take it down to FedEx office and hope they can print it for me. If I let all the little things wrong with each step stop me, I would never accomplish any part of this project. I just have to let it be what it is – it is and never will be perfect. This entry was posted in Uncategorized on September 16, 2012 by kristinoquilts. Today I got all my boutique items priced. Also made the logo heading that you see on top of my blog – big learning curve for that one! Yesterday I bagged all my artwork, made up most of my kits and worked on more patterns. I showed examples of my patterns and kits at Guild last night and got positive feedback – I think I’ll see a lot of support next week at the show. Tomorrow I need to turn in all my boutique items: 44 luggage tags, 13 postcards, and 11 individual wall hangings. I will also finish kitting because UPS delivered the last of the fabric I ordered. 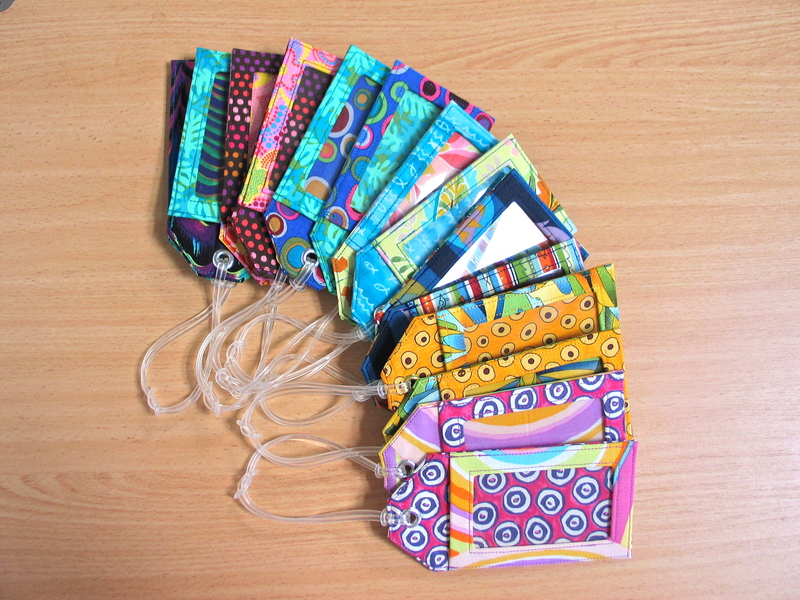 Total of twenty-two sets of luggage tags. The pattern is downloaded from StudioCherie. This entry was posted in activities on September 13, 2012 by kristinoquilts. I’m using this blog as a journal to keep me on track and document my progress. This entry was posted in activities and tagged Caps for Sale, luggage tags, Monkey Business, Nine-Patch Hash on September 10, 2012 by kristinoquilts.